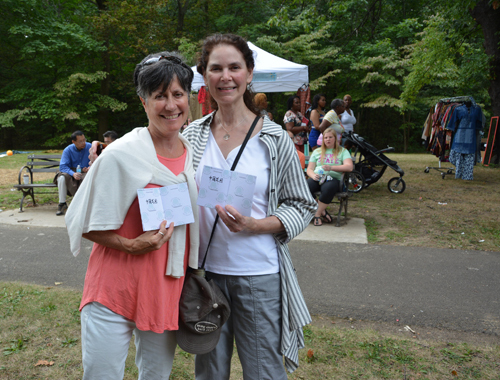 On local time August 27th, the 72nd "One World Day" event, as organized by the Cleveland Cultural Gardens Federation, was held at the Cleveland Cultural Gardens. Chinese Cultural Garden Association Chairman Eddie Ni and director Yunmei Wang, Cleveland State University Confucius Institute's director Yan Xu and associate director Xuhong Zhang, as well as other teachers have also attended. In the morning, thirty cultural gardens began to set up booths and be ready for the arrival of visitors. At noon, a grand flag parade kick started the commencement of this event. Each garden had its own representing team. People dressed in a variety of ethnic costumes to represent their home countries, waving their flags, singing and laughing along the way. 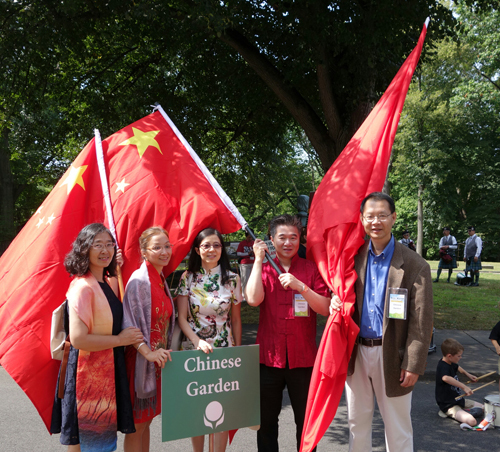 Eddie Ni, Yunmei Wang, Yan Xu, Xuhong Zhang and others of the local Chinese community held the five-star red flag on behalf of the Chinese Cultural Garden in participation in the parade. 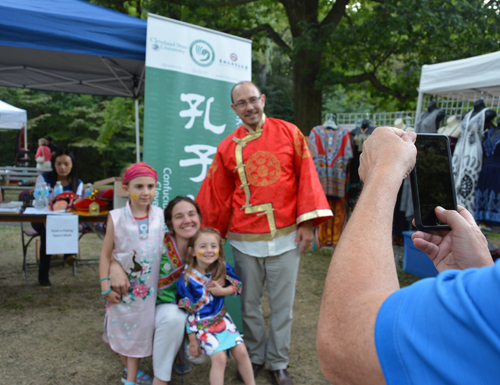 Cleveland State University Confucius Institute established a cultural booth at the Gardens, presenting the public with a taste of traditional Chinese culture. Tangzhuang and cheongsam attracted a large number of people, who were curious to take pictures and listen to the telling of the stories behind the different traditional clothing. The fortune cookies were also very popular among the crowd, a small note printed with Chinese words was embedded in each cookie, and the locals were all interested in learning the Chinese characters. Featured stickers were very much loved by the younger crowd, a long queue was formed quickly before the booth with children anticipating to collect the Chinese flag pattern stickers and stick on their own bodies. The unique Chinese traditional culture and variety of activities rendered the visitors lingering and wanting more. 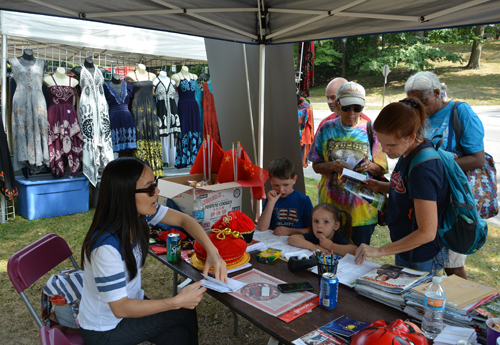 Many people have shown great interest in China, and some even started to learn Chinese and use simple phrases they had just learned to engage in small talks with our teachers at the booth. A number of which went on to inquire the Confucius Institute of Chinese courses, and filled out the registration form with intention to study Chinese. 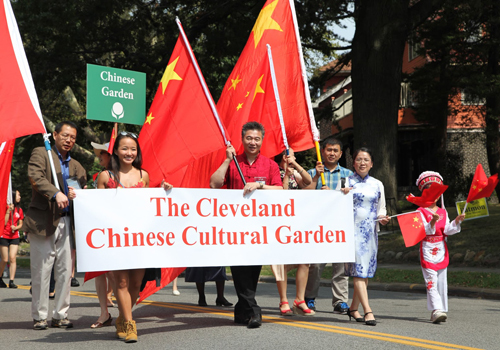 "One World Day" is the annual celebration of the Cleveland Cultural Gardens, adhering to the "Mutual Understanding and Peaceful Coexistence" theme. It has been successfully held for 72 sessions, and made outstanding contributions in promoting the friendly cross-culture exchanges between people of various countries. 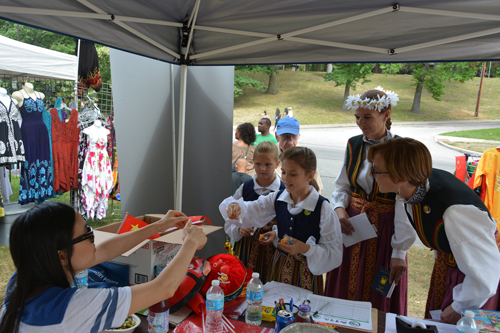 This year's "One World Day" event has invited and gathered cultural organizations, social groups, and local public of more than 50 countries and ethnic groups. People were singing and dancing in the gardens, laughing and talking, sharing their own food, music, clothing, writing and other aspects of their cultures, not only to promote and carry forward their traditions, but also to respect and embrace that of other countries, fully embodies Cleveland's diversity and inclusiveness.